Manage your accounts conveniently! With our Mobile App you can check your account balances, transfer funds, and pay your bills. Qualifying accountholders* may also deposit checks via the app. Download the app to your smart phone or tablet using the appropriate link at right, or search 1st CCU Mobile Banking in your app store. 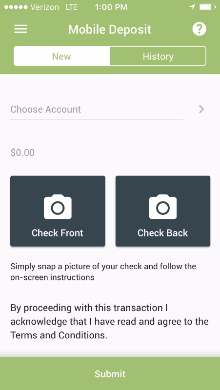 The mobile app offers the ability to see Quick Balances without logging in, or log in to view transaction history, pay bills, transfer funds, send Secure Messages to 1st CCU, send Travel Notifications for putting travel notes on your Debit Card, and fingerprint login (available on enabled-phones only). The app displays all of your cross-accounts and allows you to transfer to your cross-accounts. Members may change their password within the Mobile App. As of April 2018 members no longer need to create an online banking profile before they download the Mobile App. Please note - while the Mobile App is a convenient way to perform fast, convenient transactions and access account, an Online Banking profile will still be needed if you want to access e-Statements and e-Tax documents. Troubleshooting: A recent update fixed an issue affecting Android devices that have the operating system 8.0 Oreo. However, mobile app users who don't completely close out of the 1st CCU mobile app aren't receiving the necessary update to the app. If you are experiencing problems, please try completely closing out the app and possibly restarting your phone. We also recommend clearing the app's cache and data by going to Settings and Apps & Notifications, tapping App info and tap on app. Select the Storage tab, tap Clear Cache to clear the app's cache and Clear Data to clear the data. *Some restrictions apply for Mobile Deposit. See instructions for using Mobile Deposit below or contact 1st CCU for more details. 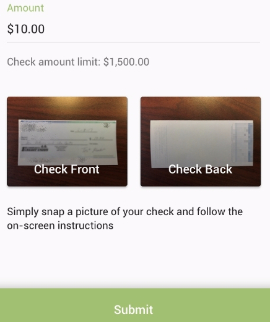 Deposit a check anytime, anywhere using your mobile device. It's as easy as writing "For 1st CCU Mobile Deposit Only" on the back of the check (do NOT sign your name on the back of the check), select the account to deposit into, type the amount of the check when prompted, and follow the step-by-step prompts to take a photo of the front and back. Once the check images are submitted you will receive confirmation that the deposit is being processed. Deposit amounts over $200 will receive a 2-day hold for check clearing, which means that $200 will be available to you right away and the deposit amount over $200 will be subject to a 2-day hold. Do not sign your name on the back of the check - signing your name will cause the system to reject the deposit. Write the approved endorsement "For 1st CCU Mobile Deposit Only" on the back of the check. Do not write anything else on the back of your check. The system uses character recognition to ensure that the approved endorsement (and ONLY the approved endorsement) has been written on the back of the check. The system will reject checks that contain a signature or any characters other than the approved endorsement "For 1st CCU Mobile Deposit Only". Bring up the 1st CCU Mobile App on your device and select Mobile Deposit from the menu. Select the account you wish to deposit into. Type the amount of the check when prompted. Lay the check on a flat surface and position your mobile device directly above the check when taking the pictures, rather than at an angle. 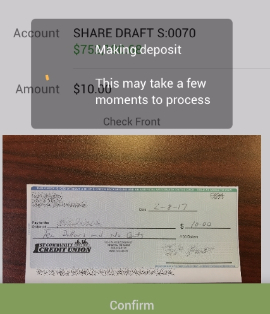 Follow the step-by-step prompts within the app to take a photo of the front and back of the check, then tap the Submit button when you are ready to proceed with the deposit. Once the check images are successfully submitted you will receive confirmation that the deposit is being processed and in most cases your account will be credited by the end of the next business day. You agree to write the approved endorsement "For 1st CCU Mobile Deposit Only" on the back of the check(s) you are depositing, to securely retain the original check(s) for a period of at least 30 days after transmission to 1st CCU, and to safely destroy the original check(s) after a period of at least 30 days. By using Mobile Deposit Capture via 1st CCU's Mobile App you indicate your acceptance of the Terms and Conditions . We are not responsible for any errors or failures from any malfunction of your mobile device, the browser or software. You are responsible for the security and security settings of your device. 1st Community Credit Union is not responsible for any virus or related problems that may be associated with the use of any online system. Your credit union does not charge for Mobile Banking, however, you may be responsible for data charges on your device. Depending on the rate plan with your mobile service provider, you may incur charges when accessing the Internet. Please consult your mobile device's service plan for details.